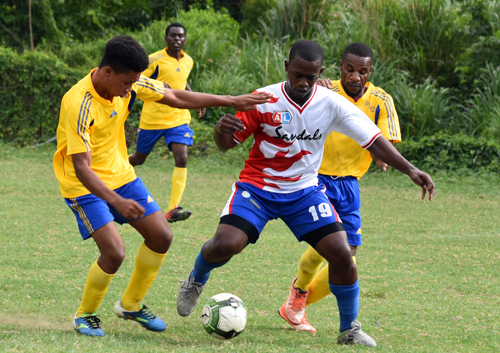 Former National League champions, Violet Kickers, will go in search of back-to-back wins when they oppose Sam Sharpe Teachers’ College in the lone game scheduled for later today, Monday, March 19, in the St. James Football Association Sandals/ATL Division One League at the UDC field. Kickers who, prior to today, have managed just a solitary win, can inch to within a point of second placed Fire House should they claim all three points. The encounter will be a mid-table clash and sees Sam Sharpe in third place, also in with a chance of moving up the standings should they table maximum points. In the final series of games played on Thursday of last week, Fire House and Norwood Strikers share the points in a dull lacklustre 1-1 draw played at the UDC field. After a listless opening 45 minutes between the teams, Chevon Graham sent a watered-down-looking Fire House ahead when he found the back of the net in the 49th minute, stuffing home from close range after getting on the end of a well-weighted cross. However, in a contest bad for sore eyes, greatly lacking in football qualities, Norwood earned a share of the spoils through Raheem Davis who found the equalizer in the 76th minute.